I was sitting back watching the boys playing the other day and silently said to myself, “I have to write this down”. We’re in the perfect groove right now, and there were so many times I thought the day would never come. 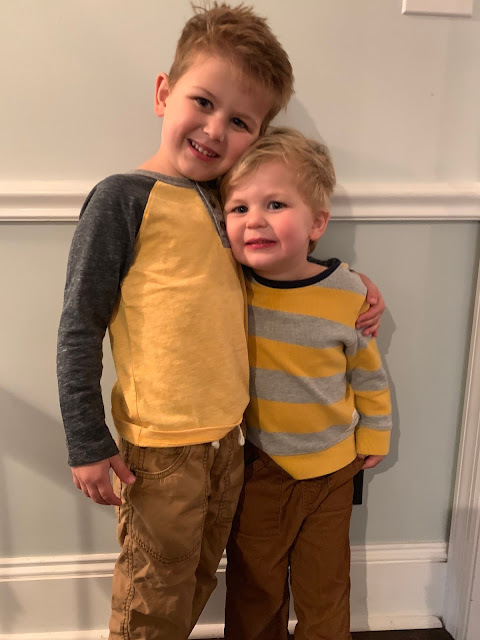 Once I sat down, the words started to pour out, a summary of all of challenges, trials, and tribulations of having two little boys so close in age. Oskar was 21 months old when August was born. Two under 2 absolutely rocked my world. Oskar was still not sleeping through the night when we brought a newborn home and was going through a terrible sleep regression (during nap time, too) right at the worst time possible. It seemed as though either Oskar or August were up at every hour of the night, taking turns screaming. I remember Googling "How many days of not sleeping will kill you." Turns out, the record held of consecutive days of non-sleep is 11, and I'm confident I need to submit our paperwork to take that title over. It took 6 full months after August was born for Oskar to consistently sleep 8:30pm-6am, and a full year for August to do the same. We rejoiced over any stretch of sleep that got us through to sunrise. Daytime felt just as tough, fueled by little sleep on anybody’s part. Oskar really struggled with the big brother transition and did anything and everything to get our attention diverted from the baby, including hitting, kicking, and biting. There was no excitement on his end over taking care of a little brother, changing diapers, giving him a bath. All of the “big brother” books painted a picture that never fit our reality. Most days involved me throwing on a sweatshirt, skipping showers, ordering take-out…surviving. On most days, work was a welcome break, even for just a handful of hours, from the depth of the challenges I felt I was facing at home. But then, ever so slowly, and without even realizing, the dynamic began to change. Age 3 for Oskar brought with it a greater level of maturity. All of the toddler fueled hitting, kicking, and biting fell to the wayside. Things got…easier. The boys co-existed fine enough, but life still involved me furiously chasing around a new walker who put everything in his mouth while also trying to imaginatively play with a 3 year old, who wanted me to be a monster, a dragon, a bad guy, a robber, or a puppy dog. He still thrived on and needed 1:1 play so much of the time, and without this outlet, quickly turned to his own destructive devices. There was never a second where I was able to turn my back, to take a break. Even though we needed to leave the 4 walls of our home, public places were the most daunting. August took off like a madman, and Oskar needed drug along, still too little to not keep an eye on. I was constantly split in half, eyes darting from one to the other, always panicked and trying to herd them together. And then, magic happened. Ages 4 and 2. Sometimes, life feels like it moves so slowly, and then all at once, you arrive. This is what all those people meant when they said, “You’ll just love having them so close in age.” For all those years before, I used to nod while simultaneously hanging on for dear life, telling whichever stranger that I sure hoped so. Little things start to fall into place that you never realized would make such a difference. Once August started talking, the dominos started to fall in the best way possible. The interaction between the two brought a whole new dynamic. They talk, they play. And sure. They argue. But they talk. So as often as I can, I try to make them work things out on their own. Oskar is also quite a tattle tale these days, which works in my favor because I know he’ll be the first to report if August is really up to something he shouldn’t be. His brother is slowly replacing my need to play with him around the clock, which leaves me time to clean, cook dinner, or get myself ready. Of course, I still step in from time to time and pretend with the both of them, but I never had the chance to take a breath and make a meal while watching the two of them play without me. It never happened before now. I can leave the backdoor open and the kids can play outside together, in our fenced backyard, only needing checked on every once and a while. They can be on different levels of the house than me for a bit, with August fully capable of carefully going up and down the stairs. When we go to other people’s houses, I can sit with the adults and catch up while the kids play in another room, or if we head to a park, both can typically run and play on their own without me frantically having to chase them. Both are potty trained, so no more hauling diaper bags. Even though it only lasted a handful of years, it still feels surreal to leave the house with only a phone, keys, and wallet. And maybe best of all, even though they both continue to be the earliest of risers, we send them to their rooms at the end of the hall to play together during those early morning hours, with the baby monitor turned on to listen in, while we close our eyes for just a little bit longer. A little piece of heaven. The best parts of these ages, though (I couldn’t pick just one), is the innocence that still remains and the absolutely hysterical things they say. We are still their heroes, and they are still so very in love with their mama and dada. Both boys love so deeply and we are their whole wide world. I don’t ever take it for granted, because soon enough, this will fade. The sweetness is only outdone by the amazingly funny thoughts, sayings, sentences, and conversations we have. They can turn any bad day right around, and as much as I try, I just can’t keep up with writing it all down. We laugh out loud a hundred times a day, and not many people can say that. We are the lucky ones, and these are the days. I wanted to write this all out for any of you parents in the trenches, because as much as you already know it, deep down inside, it gets so much better. And you’d do it all a million times over, as hard as it is. Give yourself grace, and a lot of it, and don't you feel guilty, even for a second, for another day of top knots, turning on the TV more than you ever swore you would, or eating from to-go containers. Those days feel like such distant memories now, and guess what? We are all just fine. I also look back at those little faces and think to myself, "They were so small. Why did I expect so much?" Celebrate all of the little victories, but know that struggle will also exist, which is totally, 100% OK. Sometimes I feel like I need a trophy for making it through, and then I realize: it's right in front of me. Getting a front-row seat to raising best friends…what a gift that truly is.